Inspired by the Gothic “Catherine window” of the Strasbourg Cathedral in France, “Rose Window” is a striking home accent piece that can be displayed as freestanding art or wall/window decor. The nearly foot-and-a-half-wide piece is crafted from six layers of hand-finished, laser-cut wood that enfold a sheet of richly colored stained glass. The wood stain and glass selections can be customized, allowing “Rose Window” to work with the color palette of your room. 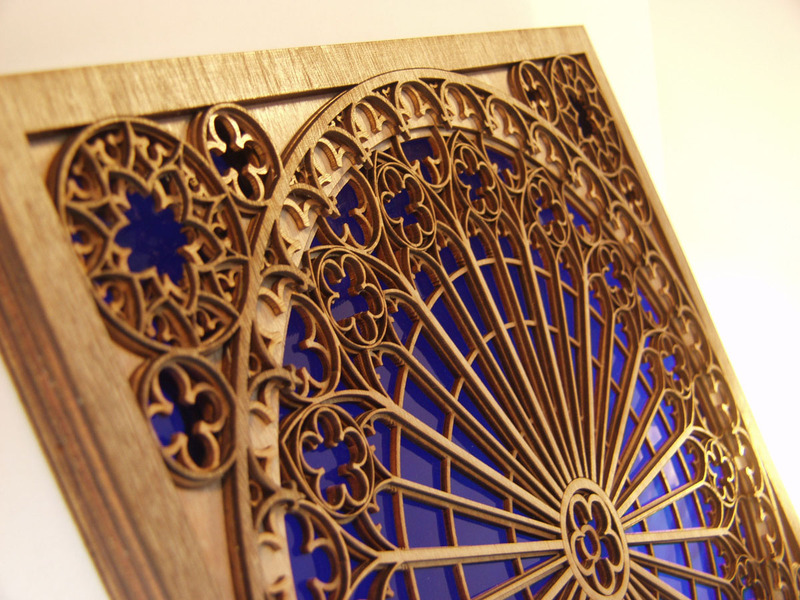 The piece can be displayed as freestanding art with the addition of a specially designed wood stand that integrates seamlessly with the “Rose Window” frame. Freestanding and wall-mounted pieces can be fitted with LED rim lights, giving “Rose Window” a radiant glow from within. 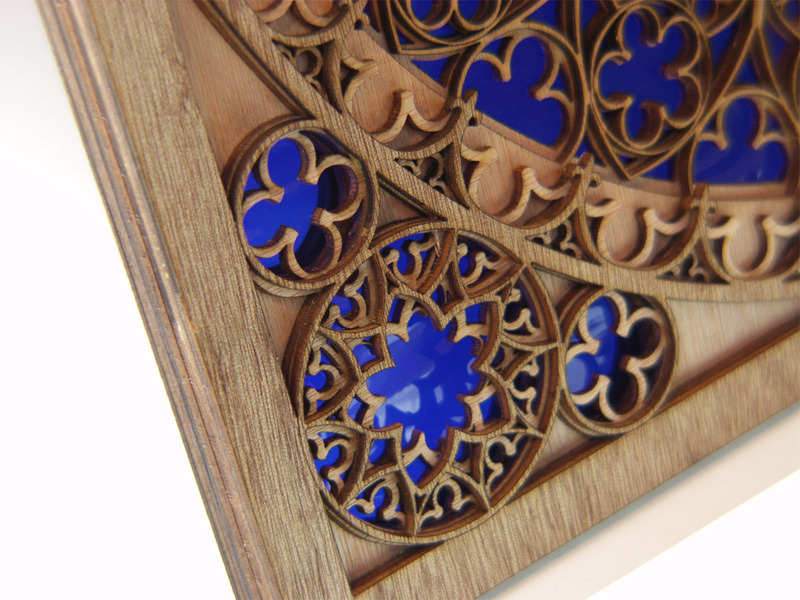 A closer look at “Rose Window” reveals the medieval symbols worked into the intricate layers of laser-cut wood: delicate fleur-de-lis, suns, quatrefoils, and of course, cinquefoils—the repeated five-petal roses from which the piece takes its name. With elaborately crafted spokes radiating from the primary cinquefoil, this Gothic design balances complexity with a symmetry that extends to each corner of the finished piece. 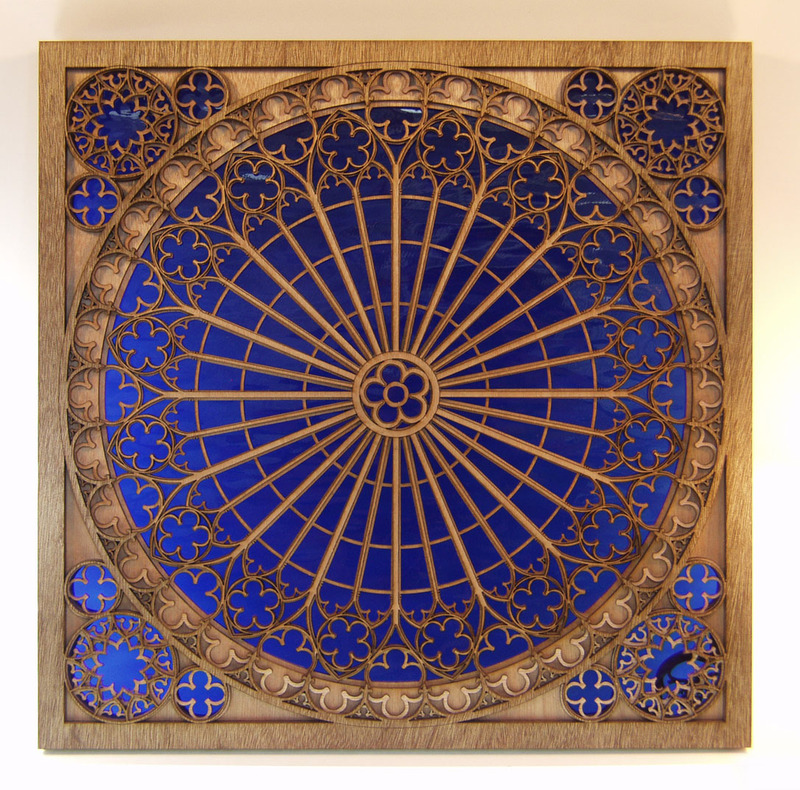 “Rose Window” allows you to enjoy the beauty of medieval-style stained glass and cutting-edge laser art in your own home.